It is so important to take care of your candles and how to burn them safely so you can get the longest burn time and the full intend of out of your candles. 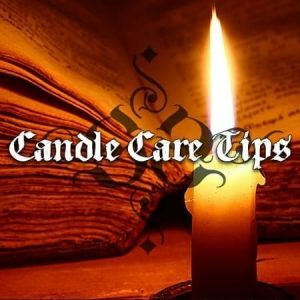 Usually, Sorcerous Sundries candles will not have written warnings about keeping candles away from light, pets and children or away from anything flammable as it should be common knowledge. Unfortunately after a few emails about not removing labels and having a 30 cm fire tower on the candle, and burning votives leaving liquid wax everywhere has lead to this being written. The first time you light your candle, whether a plain or spell candle, you MUST let it burn for at least 2 hours! The idea is to create a wax pool that reaches the sides of the candle to achieve an even burn every time it is lit. 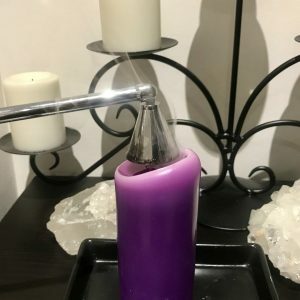 Burning a candle for less time creates a small pool of wax that will create a tunnel, this will lead to your candle putting itself out constantly and essentially rendering the candle useless. Place candles in flameproof jars or cups to double the burn time, this also prevents liquid wax from going everywhere. A votive that burns for around 8 hours will burn for 16 hours if placed into a proper votive cup. Always trim the wick before burning. Even if you're relighting a candle, trim the wick to 1/4 inch. When the wick is too long it will burn uneven and create soot/smoke, making your walls black and dirty. A long wick also creates a higher flame, this is because the wick is actually burning and not the wax. Keep candles away from direct sunlight. No matter if the candle has UV protective additives or none, candles in direct sunlight WILL lose their colour and no one wants that. If you must, and really really want to increase the candles life, you can place your candle in the freezer for 2 to 4 hours and then light it. Freezing the candle increases the burn time but Sorcerous Sundries does not recommend this. This can lead to the candle cracking, loosing it's colour or deforming in other ways. Now you have your Candle care tips, on to candle safety! Please read and follow this guide to ensure safe candle burning. Extinguish all candles when leaving a room or before going to sleep. Be sure the wick ember is no longer glowing. Always use a candle holder specifically designed for candle use. The holder should be heat resistant, sturdy and large enough to contain any drips or melted wax. Keep burning candles away from drafts, vents, ceiling fans and air currents. This will help prevent rapid, uneven burning, and avoid flame flare-ups and sooting. Place burning candles at least 6 cm apart from one another. This helps ensure they don’t melt each other, or create their own drafts that cause improper burning. Use a snuffer to extinguish a candle. It’s the safest way to prevent hot wax splatters. Or place your hand behind the candle flame and blow the candle out slowly. Always snuff out your spell candles as blowing them out (using the element Air) will undo all your hard work. Never extinguish candles with water. The water can cause the hot wax to splatter and can cause glass containers to break. Extinguish a candle if it repeatedly smokes, flickers, or the flame becomes too high. The candle isn’t burning properly. Cool, trim the wick to 1/4 inch, then check for drafts before relighting. Never use an open candle as a night light. Make sure it is away from windows, materials, sleeping area, pets and is enclosed in a night lantern. Special care should be taken when burning spell candles that contain herbs or resins. Always remove any labels, ribbons, adornments, make sure the candles not near burnable material and dust off any herbs/resins around the wick of the candle before lighting. And most importantly, NEVER leave candles unattended! Hopefully this candle care guide helps you get the most out of your Sorcerous Sundries candles and keep you (and your home) safe!